Civil rights leader, wife of Dr. Martin Luther King, Jr.
"My husband," writes Coretta Scott King in her introduction to The Words of Martin Luther King, Jr., "was a man who hoped to be a Baptist preacher to a large, Southern, urban congregation. Instead, by the time he died in 1968, he had led millions of people into shattering forever the Southern system of segregation of the races." Like her husband's life, Coretta Scott King's own life took a dramatically different turn than the one she had planned. As she relates in her autobiography, My Life with Martin Luther King, Jr., when Coretta Scott first met the young preacher, she was studying music at the New England Conservatory in Boston and had already begun a career as a concert singer. Although she had thought that she would never consider being a preacher's wife, she found her future husband to be different than the stereotyped man of God she had imagined. As she observes in her introduction to The Words of Martin Luther King, Jr., "Martin was an unusual person.... He was so alive and so much fun to be with. He had strength that he imparted to me and others that he met." 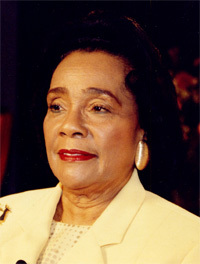 Coretta Scott married Martin Luther King, Jr., giving up her personal career plans to join him as a civil rights activist. Side by side with her husband she led marches and gave speeches, but as the spouse of a popular public figure, she also endured many hours alone. In My Life with Martin Luther King, Jr. she notes that "in spite of Martin's being away so much, he was wonderful with his children, and they adored him. When Daddy was home it was something special." 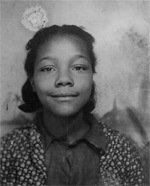 "The success of My Life with Martin Luther King, Jr. added to Coretta King's prominence as a public figure in her own right but her fame had spread even before the book's publication as she led a silent memorial march of more than 50,000 people through the streets of Memphis on April 8, 1968, just four days after her husband's death. The following day, at Dr. King's funeral, she shared her grief with an estimated 120 million people who watched on television and crowds of mourners who filled the streets of Atlanta. Her leadership capabilities were further tested soon thereafter as King strove to preserve her husband's memory with the foundation in 1968 of both the Martin Luther King, Jr. Memorial Center for Nonviolent Social Change and the Martin Luther King, Jr. Federal Holiday Commission. As chairperson of both organizations King made hundreds of speeches, logged thousands of miles traveling around the world, and met with countless national and local leaders proclaiming her husband's message of nonviolence. Her energies became focused on two goals: the opening of a scholarly center dedicated to her husband where nonviolence could be taught and studied and the celebration of his birthday as a national holiday. The first of these two projects to be realized, the Martin Luther King, Jr. Center for Nonviolent Social Change, became a realty in 1981 when the $8.4 million center was dedicated in Atlanta, Georgia. The complex includes exhibit areas, a 250-seat auditorium, a 90-seat theater, administrative offices, a library, archives and the Martin Luther King, Jr. gravesite. The Center has been instrumental in the achievement of Coretta King's second goal, the establishment of a Martin Luther King, Jr. national holiday. The Center led a campaign that collected six million signatures to present to Congress in support of the proposed holiday and sponsored annual national programs celebrating the holiday during the years between Martin Luther King, Jr.'s death and the first official celebration of the day in January, 1986. Talking about her work in an Ebony interview, Coretta King notes, "I will always be out here doing the things I do, and I'm not going to stop talking about Martin and promoting what I think is important in terms of teaching other people, particularly young people, his meaning so they can live in such a way to make a contribution to our advancement and progress."